Separating the beach from the road was a thickness of stalls that sold juice, tea, pav bhaji, fritters and other street snacks, the many-layered flavours of which could never be replicated in the sanitary conditions of a restaurant. Rickety square stalls with torn calico coverings were stacked side by side, each a busily functioning unit within itself, much like cells in biological tissue. Cries of vendors declaring the delights on offer were carried on the warm Bombay breeze alongside the scents of deep-fried chickpea batter, a myriad of masalas and the inescapable, faint undertone of sewage. Juhu beach stretched beyond the bustle, less populated but still littered with vendors, children’s rides and sand artists with their temporary sculptures. I would always ask for a paper cone, either filled with roasted peanuts or a dry street snack, Chivda. They were portable, neat and most importantly allowed me to keep walking, the little girl trailing behind her parents. They were also considered ‘safe’ to eat……not a drop of water or unwashed vegetable in sight. When the lovely Claire of Claire K Creations organised the Foodie Secret Santa, I jumped at the chance to participate. The idea is to make a Christmas treat and send it out to the three people you are allocated. Soon enough, each blogger receives three treats from different bloggers. So far I’ve received some moorish roasted peanuts and chilli jam from Claire herself, and some divine pecan balls that were reminiscent of a favourite childhood biscuit from another blogger who seems to wish to remain secret! 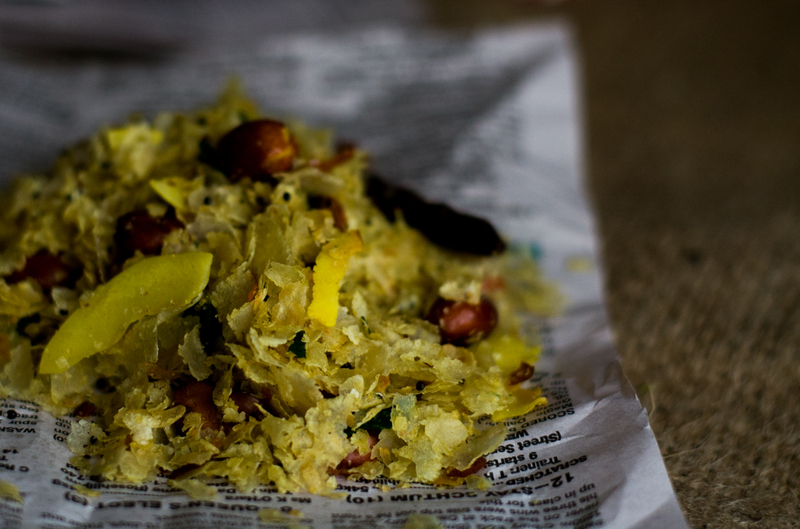 As Christmas is not a traditional festival for me, and I guessed that there would be plenty of sweetness in the air during this season as it was, I decided to make an Indian savoury street snack, Chivda. This is my mum’s version, using flattened rice as the main ingredient. We usually have a big bottle of this nestled in the pantry at any given time, to snack on with tea or to serve with cold drinks. The light, crisp rice flakes are dotted with crunchy peanuts and pleasantly interrupted by chewy coconut. A little salty with a suggestion of sweetness, it is naturally gluten free and vegan. Frying the poha (flattened rice) on a low heat does require some patience but after that, the process is fairly quick and uncomplicated. This recipe makes a large quantity which can be stored in an airtight container at room temperature for at least a month or for longer in the fridge. Here in Sydney the lead up to Christmas has been a sombre one, with the horrific tragedy of the Sydney Siege and news of other atrocities elsewhere in the world. It seems all we can really do is pray for the human race and hope that the people affected can somehow go on to lead positive lives. Despite everything, I wish you all, with all my heart, a Merry Christmas. In a large heavy-bottomed frypan, heat 4 tsp oil. Add the poha and reduce the heat to very low. Toast the poha, stirring constantly to make sure the flakes are evenly toasted. 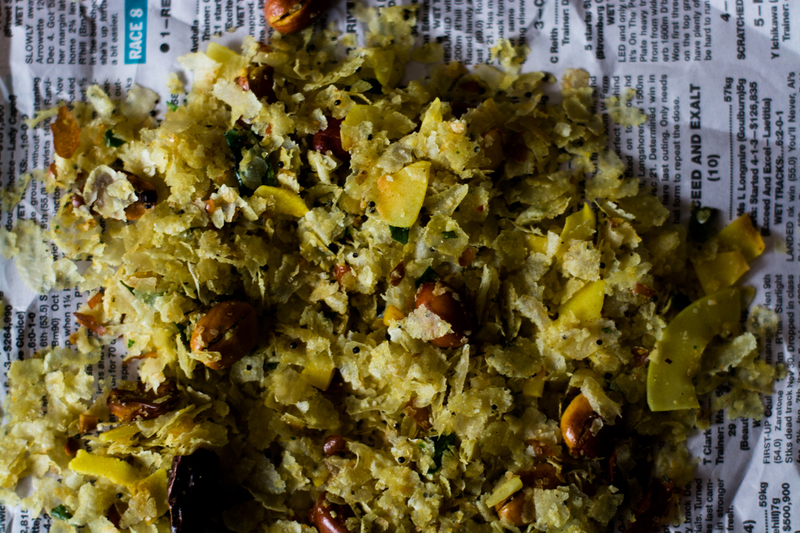 The poha should curl around the edges and gain a little colour very gradually over about 20 minutes. 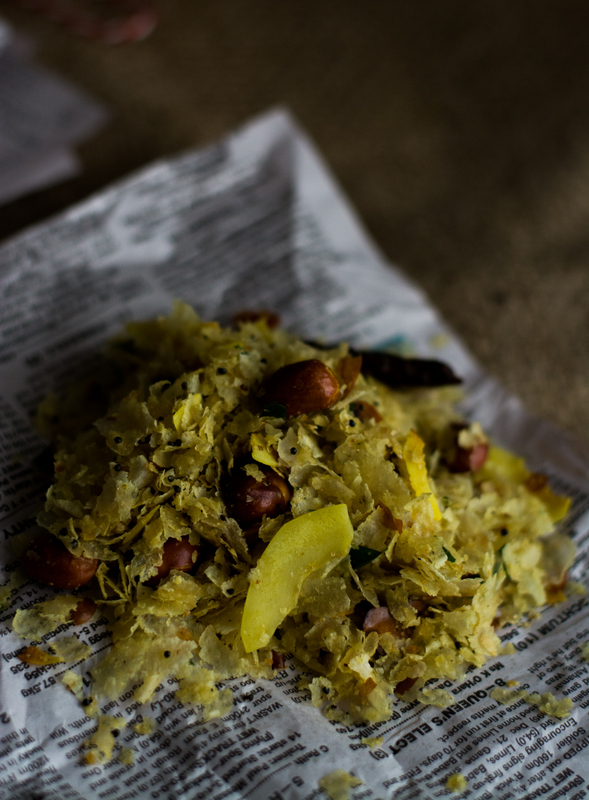 When the poha has slightly browned and crumbles easily between your fingers, pour it into a large bowl and set aside. Turn the heat up to medium and heat the remaining 4 tsp oil. Add the mustard seeds and when they have finished popping, add the peanuts. Take care not to burn the mustard seeds. Fry the peanuts on medium heat, stirring constantly until they are a golden brown colour. Add the turmeric, asofetida and curry leaves and fry, stirring, until the curry leaves have crisped. Add the coconut flakes and fry, stirring, until they have browned a little. Add the toasted poha back into the pan with the other ingredients with about 1/2 tsp salt and the sugar. Stir to mix well, but this time be gentle so that you do not crush the poha too much. Taste and add a little more salt if needed, then stir again. Transfer the chivda to a large bowl and allow to cool completely before packing into an airtight container. 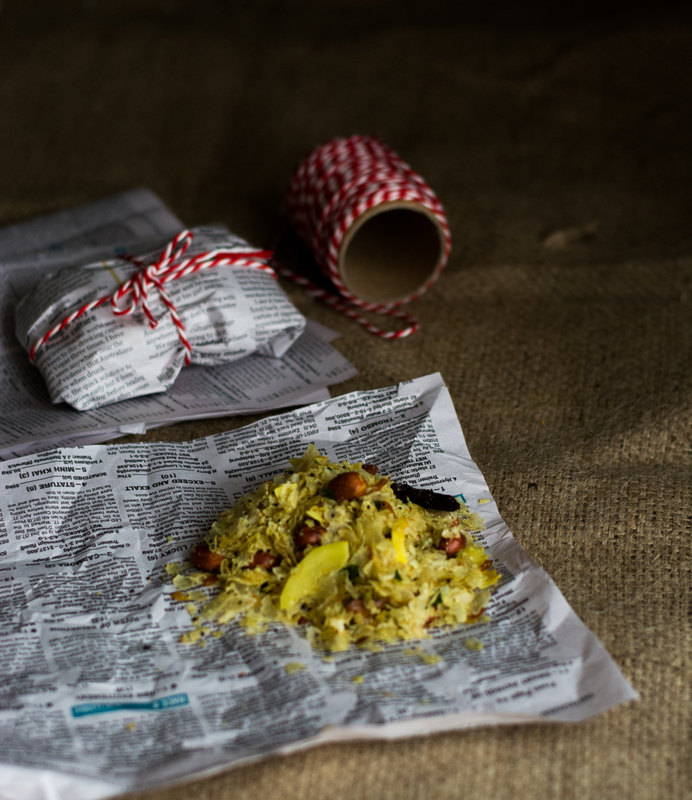 Poha, dried red chillies and spices are available at Indian grocery stores. Hi Deepa wonderful narration of sweet memories of Juhu beach. Chivda is my all time favorite. Merry Christmas to you and keep writing. Loved this post. Took me rightt back to Bombay 🙂 the chivda looks wonderful. Love those little packets! These were just lovely Deepa. ..thank you so very much! You are more than welcome. Merry Christmas! That looks absolutely delicious Deepa. Merry Christmas! This sounds absolutely wonderful and something that my husband would absolutely love! Thanks for sharing. To you as well, Deepa. And what a wonderful package that would be to receive in the mail! Thanks so much for participating. This looks wonderful. I have to ask… where do you get rice flakes? My mum was looking for them a while ago and never found them. Have a Merry Christmas! Thanks for organizing Claire, it was so much fun! You can get dried rice flakes at Indian grocery stores. They come thin or thick and the thin ones work best for this.